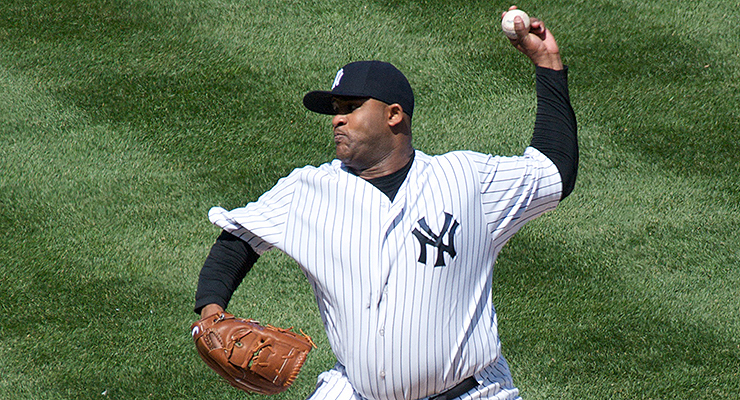 CC Sabathia is nearly in a class by himself (via Chris Ptacek). African-Americans and Latinos earn significantly less than white people in the United States. Overall, incomes for African-Americans are about 35 percent lower than for white people, and Latinos earn about 39 percent less. A little more than half this difference can be explained by differences in education, occupation and experience, but outside those factors, there is still a large and persistent gap in earnings by race. Why? The explanation may be something other than willful discrimination or employer bias. There may be unobservable traits related to life experiences that wound the ability of African-Americans and Latinos to earn more money. Major League Baseball is a fertile ground to study earnings differentials, because it has fantastic measures of earnings productivity. There is nothing close to WAR available to measure productivity of CEOs, doctors, waiters or construction workers. Opportunity to become equally productive is hard to measure, but we know that there have been fewer African-American players over time, and I have shown in the past that this is primarily due to differences in opportunity. Players from wealthier backgrounds (especially with year-round playing weather) have been able to develop skills earlier and more thoroughly than potential players of modest means, which has led to fewer African-American players. On the other hand, globalization has given Latin American players opportunities that they would not have received decades ago. Even though there have been differences in opportunities for people of different races to become baseball players, that does not necessarily mean that there is any earnings difference for players of similar productivity. While measuring this is hard in many professions, it is relatively easy to study for baseball players. Gary Becker was the first economist to develop a formalized theory of discrimination in the 1950s, and his seminal work was a large part of why he won the Nobel Prize in Economics in 1992. Since Becker passed away in May, his work on discrimination has been in the forefront again, and major league baseball salary data is a logical application of his work. In developing his theories, Becker noted that the capacity for discrimination to have an effect varies by situation. As he explained in his Nobel acceptance speech, “The analysis shows that sometimes the environment greatly softens, while at other times it magnifies, the impact of a given amount of prejudice.” Becker viewed discrimination as a decision that some individuals make, a choice to avoid a psychological cost they face when hiring or transacting with a group they dislike. This distaste for groups of people can be especially destructive in some circumstances, yet impotent in others. Becker discussed when discrimination’s impact would be the most potent. In a hypothetical perfectly competitive market, discrimination would have no impact. If African-Americans, for example, were paid less for equal production, greedy but unprejudiced employers could take advantage of this differential by hiring only African-Americans at a slightly lower wage, lowering prices, and driving discriminatory employers out of business. If this sounds oversimplified, that’s the point. Few markets like this exist, but it provides a canonical example. Discrimination can have an impact when certain assumptions fail to hold. Becker discovered that discrimination would be most prominent when there was potential for an unprejudiced owner to lower his cost by primarily hiring members of the victimized group. Since whites outnumbered African-Americans by a factor of roughly nine to one at the time, Becker pointed out that employers would be limited in their ability to compete by hiring among a small minority. But the larger the size of the victimized group that an unprejudiced owner could hire, the harder it would be for prejudiced owners to compete. Given the large share of talented black athletes, it would be difficult for a prejudiced sports team owner to compete without hiring them if they earned less than comparatively productive white athletes. Think of Donald Sterling, the former owner of the Clippers in the NBA, who was deposed by the league after his discriminatory beliefs came into the public eye. Sterling owned the Clippers for 33 years and presumably held these views the entire time. How did the Clippers compete in a league where the majority of players are African-Americans? He hired them anyway. Sterling expressed beliefs that his players should be grateful, saying, “I support them and give them food, and clothes, and cars, and houses. Who gives it to them?” Most people do not think of paying people for work as a gift but as a mutually beneficial exchange. However, Sterling could not compete without paying his players, so he did. In a market where there are fewer minorities, discrimination could be more prevalent. Baseball probably fits in the mold of basketball, even if there are far fewer African-American players. If an owner limited himself to white outfielders, he would have trouble competing. On the other hand, Becker found that when it is difficult or impossible to form a competing business, discrimination among existing employers in an industry can persist despite an abundance of talented minorities. Until Jackie Robinson broke the color barrier, team owners had an implicit agreement not to hire black players. An unprejudiced entrepreneur couldn’t create a 17th major league team and hire Robinson and other talented black players at a discount, so discrimination continued. Although baseball continues to forbid creation of new teams without the league’s permission, there is no longer cooperative willful prejudice among team owners to restrict black players. At the same time, the inability to compete outside major league baseball’s structure can and does lead to persistently mispriced labor (the primary reason why sabermetrics has taken hold only in the last decade), so it may still be possible for racial earnings differentials to persist in baseball if races are disproportionately represented among mispriced types of players. Discrimination also can come from customers or fellow employees. If customers are prejudiced against a minority, this could lower the earning power of that minority. Again, Jackie Robinson’s experience is illuminating. Many fans clearly were unhappy that black players were allowed, which undoubtedly enabled discrimination to persist in baseball for many years. As prejudiced fans became less prevalent over time, the financial cost to owners from boycotts and other prejudice-rooted declines in ticket demand shrunk. However, if some discrimination still exists among fans, it could cause a small racial earnings differential. The notable share of African-American and Latino players and the fierce competition between teams provide strong forces against differences in earnings, but the limit on the number of teams and potential for customer discrimination allow for the potential for an earnings gap. I have gathered data on free agent earnings for nearly a decade and can test which effects dominate. From 2006 through last season, 2,310 players have earned major league salaries while having the six years of service time required to be eligible for free agency. I have incorporated the average annual value of their contracts, but also adjusted for draft pick compensation. The short version: I have approximated the market value of draft picks (as measured by the difference in earnings between players with and without draft pick compensation attached) and added (or subtracted in the event of future draft picks gained) the discounted value of future wins while subtracting (or adding) an estimate of signing bonus for a given pick. I used this to develop the annualized cost of a player’s contract combining the salary cost directly, as well as the implied draft pick cost. Not all players would have earned the same amount per WAR through the last eight years, even if WAR had been forecast perfectly. Growth in wages over time (wage inflation) is the most obvious source of this difference. Teams paid roughly $4.8 million per WAR in 2006, which grew to $7.4 million per WAR in 2013. The following table shows the cumulative data I used to estimate the cost per WAR for each from 2006 to 2013. “Net AAV” is the average annual value of a player’s contract, net of the league minimum salary, “Picks Win Cost” is the estimate of how many wins teams sacrificed in the future (discounted by 10 percent per year) by foregoing draft picks, and “Picks Bonus Saved” is the rough estimate of the signing bonuses saved by not making those picks. The cost per WAR is computed by dividing the difference between Net AAV and Picks Bonus Saved by the difference between FWAR and Picks Win Cost. This ignores differences in cost per WAR by position and by whether a player was re-signed, which will be discussed later. The first change needed to properly estimate the cost per WAR was an adjustment for wage inflation. First I developed the cost of an individual player’s season by taking the Net AAV, subtracting the Picks Bonus Saved, and adding in the Picks Win Cost multiplied by the cost per WAR for each player. Then I inflated that cost into 2013 salary terms, so that a player who earned $9.6 million in 2006, the average cost of 2.0 WAR, would have a year-adjusted cost of 2.0 WAR in 2013, which is $14.8 million. This table shows that blacks (African-Americans, in particular) and white players earn just about the same amount for a given amount of production. However, Latino players earn about 12 percent less than African-Americans and whites collectively. Asians earn six percent less than African-Americans and whites themselves, but the sample size is too small to know if this is a persistent differential in pay or a couple players outperforming expectations. The difference in pay for Latinos is surprising, however, and requires more thorough examination. Furthermore, simply noting that African-Americans and whites earn roughly the same amount does not mean that they are not treated differently, because this could be the sum of roughly equal opposing forces (e.g. the market’s overpricing of outfielders raising the wages of African-American players, but discrimination lowering them). It is important to note that none of this is because of relative age of contract statuses. There are enough players in each race category that they are roughly halfway done their contracts on average. One of my favorite sources of differential in cost per WAR is between players who were re-signed by their previous teams, and players who were signed away from their old team. (I discussed this in my 2012 Hardball Times Annual article, “Down with Other People’s Players,” calling re-signed players RSP and other people’s players, OPP.) As I have noted in more recent articles, much of the historical hitter OPP premium is due to the fact that re-signing one’s own “Type A” free agent hitter used to require foregoing two draft picks that would have been obtained had a “Type A” free agent signed elsewhere, but the difference in the price of pitchers persists. Pitchers cost 24 percent more per WAR when their former teams allow them to sign elsewhere, which I have demonstrated is primarily due to former teams having knowledge of a player’s likelihood of developing an injury or of his performance declining in general—pitchers typically fail to match their projections after signing elsewhere. If there are significant differences by racial composition among pitchers who signed elsewhere, this could bias the results of average cost per WAR by race without race having an impact directly. The distribution of OPP and RSP does not appear to be too different by race, however. Another source of differences in pay per WAR is position. Outfielders, and especially relief pitchers, tend to be paid significantly more per WAR than average; middle infielders and catchers tend to be paid less per WAR. I have found that players fall into four rough categories that get paid differently by WAR. The highest-paid category is relief pitchers, followed by bat-first positions (first base, outfield, designated hitter), followed by starting pitchers, and finally glove-first positions (middle infield, third base, catcher). This does not appear to derive from inaccuracies in the computation of WAR, since replacement level bat-first positions actually tend to play slightly above replacement and replacement-level glove first position tend to play below replacement level. That would suggest that a more accurately calculated WAR would increase the discrepancy between bat-first and glove-first positions. On the other hand, calculating relief pitcher WAR is challenging, so that may be a source of bias in the positional price of WAR. Regardless of the reason for the discrepancies in positional cost per WAR, searching for causal racial earnings differentials should subtract out both the positional WAR bias and the OPP premium for pitchers. The table below shows the cost by race for each position, as well as the cumulative cost (salaries plus draft pick cost) among players in each group. The low pay for glove-first positions and the high share of Latinos who fill these roles is clearly a major cause of the relatively lower pay for Latino players. At barely over $5 million per WAR (in 2013 terms), about 30 percent below the average free agency-eligible player, infielders do not get paid as much per WAR, and Latinos’ cumulative cost per WAR is low partly because of this. Latinos do not appear to be paid much less than African-American or white players at these positions. However, they do appear to be paid less at bat-first positions, but more as starting pitchers. The very low cost per WAR among black starting pitchers is an artifact of small sample size—CC Sabathia has earned about 80 percent of the cumulative $188 million cost, and has outplayed his contracts. Before adjusting for position and re-signed status, it is helpful to see the shares of players in each of these categories, is shown in the table below. There was no major difference among races in their relative shares of re-signed players or players signed by new teams (RSP, OPP). However, there are significantly more white pitchers (especially starters), than there are in the player population as a whole. There are also considerably more African-American players at bat-first positions than there are in the population as a whole..
Latinos make up a third of all players who have reached free agent eligibility, but they comprise half the players at glove-first positions. Asian players who have reached free agency have been almost exclusively at bat-first positions, mainly because three quarters of these earnings come from Ichiro Suzuki and Hideki Matsui. I adjusted for position first, by inflating or deflating the cost of a given player so that all position categories cumulatively cost the $7.4 million average per WAR. (For example, since glove-first positions get paid only $5.2 million per WAR, their costs get inflated by a touch over 40 percent so that all positions effectively cost $7.4 million per WAR.) Then I adjusted by re-signed status for pitchers only, deflating relief pitchers who changed teams by three percent and starting pitchers who changed teams by seven percent, while inflating re-signed relievers and starters by five and six percent, respectively. This leads to the following adjustments to cost per WAR by position. Note that Latinos still earn slightly less than the average player, while whites earn slightly more. Asians earn much less, but this is a function of the small sample size, and mainly because of Ichiro Suzuki outplaying his contracts. Although the adjustment for glove-first position players earning less pushes the cost per WAR for Latinos toward the average overall cost, the share of re-signed players is roughly similar to the rest of the population. Yet there is still a more subtle difference between Latinos and other re-signed players, which is that they take steeper discounts to re-sign early. There are a couple major causes of the OPP premium. The primary one is that teams appear to know more about their own players than other teams do, mainly about their own pitchers. The other cause is that some players will take a discount to re-sign early. Although re-signed players cost less per WAR than players who change teams even when they reach free agency, players who re-sign even earlier (earlier than Opening Day of the last year before free agency) earn significantly less. I had never checked whether this group varied by race. However, look at the major discounts that Latino players take to sign early in the table below. White players do not seem to get paid less when they re-sign more than a year before free agency, but black players do. Latinos take a severe discount and sign for $4.9 million per WAR when they sign early. Obviously Albert Pujols’ contract plays a role in this, but even excluding him the earnings per WAR among Latinos who re-signed more than a year before reaching free agency would be $5.3 million, far less than the pay per WAR for white or African-American players. This is actually not surprising. An individual’s willingness to sign early is largely based on his desire for financial security. If a player has strong earning potential outside of baseball, he will not be as willing to surrender potential future earnings for current financial security. A player who is more likely to face economic hardship if he gets injured and fails to earn a fortune in baseball will be more amenable to a team-friendly discount. The average income in the United States is over $50,000 per year, while the average income in much of Latin America ranges from $10,000-$20,000 per year. It is far more risky for a Latin American player to forego financial security later if he risks being transplanted back into a weaker economy. I believe this is probably the main cause of lower earnings among Latinos who re-sign early, and in addition to the lower market value on glove-first players, this explains why Latinos earn less per WAR on average than white or African-American players. The last thing that I thought would be worth checking was a regression on the ratio of WAR to cost of a player’s contract, adjusting for position and race, along with an adjustment for re-signed pitchers and re-signed Latinos. The results are in the table below. The differences in positions are statistically significant, while the differences between races are not at all. However, the coefficients for re-signed pitchers and re-signed Latinos are directionally as predicted and a large sample size would quite possibly have led to statistical significance. Over time, the understanding of racial earnings differential has evolved. Thanks to seminal research by Gary Becker and subsequent empirical studies, we have learned that most of the difference in earnings among races is a function of occupation, education and experience, yet a large share of the earnings differential cannot be explained by these factors. Baseball provides a useful industry to study because productivity is so measurable. It is also an industry where competition is fierce, and the ability of a general manager or owner to compete with a bias against a race of players would be severely hampered. As a result, there is not much difference in earnings by race. Although baseball has strong incumbency power (no new teams can pop up without league permission), which can often be associated with racial earnings differential, this does not appear to have much effect in practice nowadays. Furthermore, since fans are focused more on winning than the race of players, customer discrimination appears to be a minor issue. That does not mean that cumulative earnings by race are equal. There are far fewer African-American players nowadays than their share of the United States population would suggest. This mirrors the explanation that lower education and less experience combine to give African-Americans less earning power. Something analogous appears to have happened over time in major league baseball. Travel leagues and expensive coaches have given wealthier players the leg up over time; I have shown previously that players come more frequently from wealthier communities than they have in the past. However, conditional on acquiring the skills to match their talent, black and white athletes from the United States earn similar amounts for a given amount of production. Although there has been a rapid rise in the share of Latino players, they are still not proportionately represented in the majors. Latin America has nearly twice the population of the United States, yet Latin American players make up only 33 percent of major league players. While some might say that would make sense given the U.S. base of major league baseball, I doubt many Latin American athletes are choosing to forego playing baseball in the United States to dominate leagues in their home countries. Even though African-Americans are not proportionately represented in the majors, they earn the same relative to their production when they do make it. The same is not true for Latinos, who earn less than white players or African-American players per level of production. The research in this article suggests that there are two primary causes for this. One is that glove-first position players get paid substantially less per WAR than comparatively productive players at other positions, and Latinos play glove-first positions far more frequently than other races. The other reason is that Latino players are more prone to take discounts when they sign extensions far in advance of reaching free agency. Even though African-Americans earn less than white people in the United States, the average income among African-Americans is approximately twice as high as in Latin America. The risk of failing to sign an extension is far greater for a player who will not have the same ability to earn a living outside of baseball. These two factors combine to explain the earnings gap between Latinos and players from the United States. Racial earnings differentials are persistent and problematic, and they can often be explained by opportunities. Major league baseball appears to be no different. Becker was correct when he predicted that more competition can drive earnings together for comparatively productive people, but the opportunity to become equally productive is not equal across races even in baseball. Outstanding, Matt. You’ve been doing some very heavy work in a potential minefield, and you’ve earned our thanks. Wow. A lot of impressive work and insight here. I think you should maybe refocus the research on drafted players only. Imported player’s contracts are skewed because their previous experience is different. Abreu, Tanaka, Ichiro, Puig, these guys were all “imported free agents” with no previous major league experience. They sign long contracts, and their posting fees do effect how much major league teams are willing to pay them. So guys like Abreu, Puig, Chapman, etc. who signed major-league contracts wouldn’t be counted until after they have six years of service time. I’m not sure if guys like Ichiro signed long contracts when they came over, but if the methodology is 6 years of service time, there are guys like Tanaka who signed a 7 year contract. Potentially the player’s later years of their first contract would be counted, and these first contracts are skewed by factors like posting fees and what not. Matthew is correct that I excluded guys with less than 6 years service time, including all of the contracts with posting fees attached. Tanaka is the only player as far as I know who signed a 7-year deal and his first post-6 season will be 2020. So if I redo this analysis in seven years, I’ll make sure to drop the one player whose value is complicated by the posting fee. If you can find another example, I will check and make sure that I didn’t accidentally include someone else. How do you categorize multi-racial players such as Giancarlo Stanton, Derek Jeter, Yu Darvish? … and I understand that Stanton has not reached six years of service time. He was just an example of the type of player I’m curious about. It’s true that’s a limitation. I followed the rules that Armour & Levitt did when they put together the original data set. Darvish was counted as Asian, Jeter and Stanton both were counted as African-American. Obviously there is some overlap, but that type of classification probably would not affect the averages much. This is one of the finest pieces of research I’ve read in a long time. This is fascinating work, especially with regards to Latino players being more likely to take a discount on an early extension to have financial security. This could be one of the hidden benefits for teams who invest heavily in scouting in Latin America. However, despite the apparently willingness for Latino players to take a discount, I thought that it was interesting that their early re-signing rate was much lower than for White and Black players (22.5% vs 39% and 40%, respectively). This is a really good point. I suspect that is a function of the positions they play, and the teams propensity to sign certain players. I think that the biggest determinant of whether a player signs an extension is whether the team wants to in the first place, and then how much of a discount they will take. But assuming they almost all take some discounts, teams are going to pay as little as necessary to close the deal, and the amount necessary to close the deal is dependent on the opportunity cost of the player. It seems hard to believe that Latinos are leaving millions on the table compared to other groups because the other option is to make $30,000 less. Still sound hard to believe? To me? Yes. I think a large role might be played by differing cultural ideas about loyalty, and perhaps differences in interaction with Agents, who seem to be exclusively anglophones. Of Course, I have no evidence for this, but I doubt that any player who has earned at or above the major league minimum for 6 years is going to be destitute if they experience a career ending injury. Additionally, such injuries are quite rare, nowadays. Almost all injuries permit a recovery which may permit the continuation of one’s professional baseball career. Permit permit permit. Reminds me of Swydan. Actually I’m specifically NOT talking about players with 6 years service time. I’m talking about players who signed early extensions before then, often years before then. Most have not earned much yet, which is the whole point that I’m making. For multimillionaires, the story would be different. Okay. I was under the impression that most all of the extensions that were signed were just 1 or 2 years before free agency. However, I still find your hypothesis relatively implausible without more data demonstrating how common such career ending injuries are (I imagine Jeff Zimmerman did something on this, but I wouldn’t begin to know where to look). I simply can’t believe that so many latino players are that risk averse. I agree. That seems to be somewhat of a copout. I think one problem with this analysis, is that the sample sizes are just too small, even in the case of white players. I’d additionally like to know about the impact Insurance market, though that seems in a nascent stage of development. Maybe there are unpublicized insurance deals (like Max Sherzer’s) that are more often taken up by white players. There’s no reason to believe that, but I suspect the insurance market plays a larger role than we know, at least in providing agents alternatives. And I’m a very a liberal guy who is very sympathetic to issues of gender and race discrimination. But this area of study is not telling. In fact the numbers basically show that there is none and anything you see is basically a function of the absurdly small samples you are dealing with here. But this area of study is not telling. In fact the numbers basically show that there is none and anything you see is basically a function of the absurdly small samples you are dealing with here. So the diminishing Utility of earnings is stronger than in players from developed Nations? That’s an interesting idea. No, that’s not quite right. It’s that the diminishing utility of consumption is relative to the price level, which makes perfect sense. If everybody had the exact same function U(C/P) where C is consumption and P is price level, then moving to a country where the price level is lower (conditional on the exchange rate), then U(C/P) is higher, so U'(C/P) is lower where U'(C/P) is the derivative of utility (a.k.a. the marginal utility). It’s a good point, and makes sense. That’s essentially what I was trying to express, though I wonder how often major league players actually return to their home country versus staying in America or Canada. Is it almost universal? Do visas make it difficult to stay? I don’t know. In any case I’m not terribly good at expressing myself. Mr Punch– yes, definitely you need to look at share of African-American players relative to share of US-born players. That’s what I did in the original article. Also, very good point on the relative utility of consumption at different price levels! I hadn’t thought about that, but it’s very plausible. Great work. I hope you’re going to share this with the academic community, too.